Alice Maher just has done it too, calling her exhibition at South Gallery Thurles,Tipperary (opens March 28, 2018) Vox Matter. Is it a new take on art shedding its chains to particular time, period, style? Similar ahistorical move exhibits the current web page by Woodland Trust displaying this ” fictional forest”. On the surface level – they all introduce an idea of continuous existence, of simultaneous existence. Those parallel marks, contrast light, and repetitive modelling, all appear in the current Godbold’s exhibition. 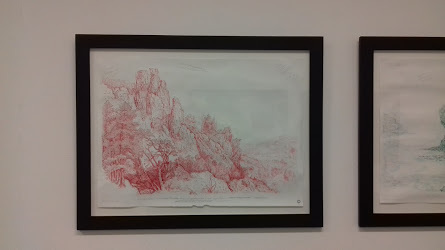 For example: Just don’t give up (2010, ink and pencil on paper, 54 x 75 cm) is drawn with red ink and pencil – as a simulacrum of red chalk favoured by the European painters of Gothic and Renaissance, including Raphael and Leonardo. The appearance sets a doubt about authenticity – a viewer may be forgiven to think that it is an old work of art or a Godbold’s copy of one. The confident parallel marks betray that neither is correct. The marks are fluent, vivacious and energetic – not hesitant copies. Moreover, the same composition appears in an acrylic painting in a larger size, displayed on a diagonally opposite wall. Viewers would need to walk the whole length of the gallery to become aware/certain of the similarity. Godbold deliberate use of a display as a tool to construct a meaning, allows similarity becoming surprising, and issues a call to the viewer to go back and look again. Doing so forges a story, or several stories. One story offers a “death of the new”, the new formulated by Modernism as partaking in the inner life of the artist – not observable. Godbold dual use of the same model sincerely admits that he collects images, like a 19th C botanist would flowers and seeds. The aesthetic categories tied to the New are tied to the old, through a remake. Remakes are appropriate in films and theatres – rarely in paintings, notwithstanding the fascinating Picasso’s work with Las Meninas by Velasquez. 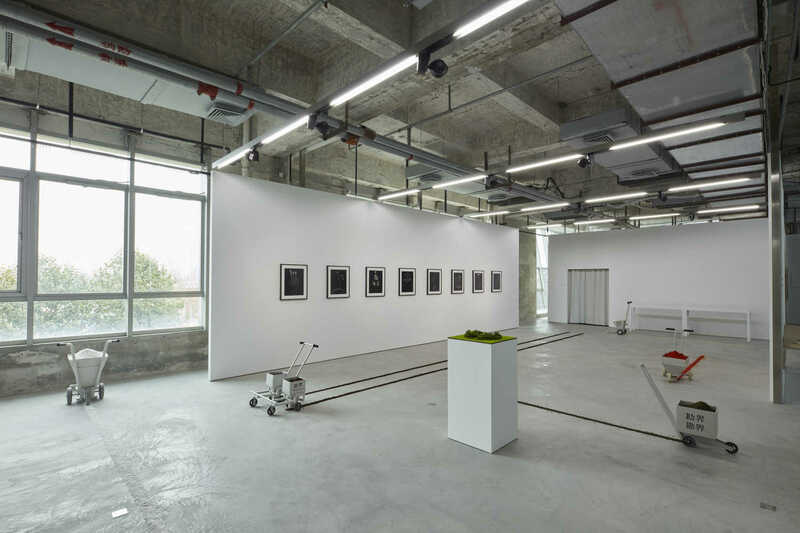 Godbold limits appearance of one model to two – in this exhibition. As if he wanted to say look and look again once. Significantly – this is what his art is rooted in. I recall William Blake’s thought: “…the windows of our perception are cleansed when we are drawn in or out by stories”. One such story is charmingly chaste in these two related paintings. Its daylight sibling lives under an absurd title 100,000.000 Angels singing, (2008) Both accessed on http://www.kerlingallery.com. Observant comparison rewards the viewer with tiny changes in what is visible, e.g. the smoke from the chimney is clearer in the daylight variation, which lost a little of tree trunk on the left. Those are substories to the story of sameness and difference dependent on light. Plato chose a Demiurg to deal with those two (in Timaeus). Godbold makes the score for each of us to play with, to invent our story. He significantly departs from the distrust that forged Kandinsky’s On the spiritual in Art, 1911. And he shares the confidence that his art also provides the kind of experience valuable in its own right and not obtainable from any other activity. His round-about selection of models, as something already visible as art, forges with his responses a kind of a silent fugue. Admirably – he respects each model with humility, which was not his chosen mode early in his practice. He used to scar, eliminate, visually assault parts of the appropriated images with large gestural marks, that abandonned hope of avoiding vulgarity. 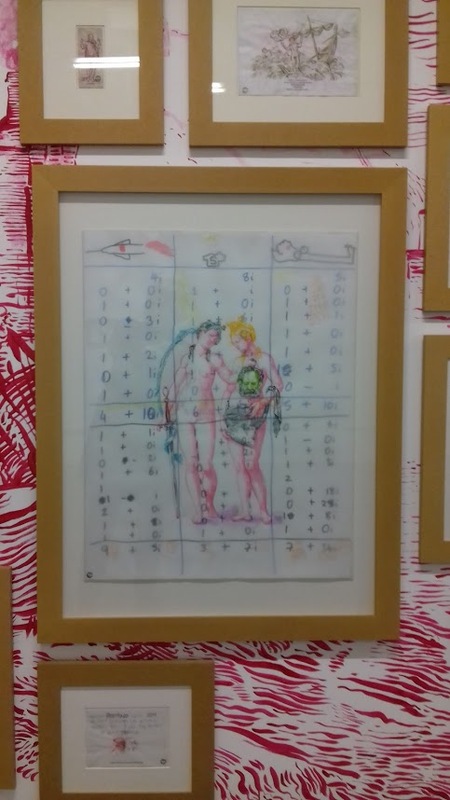 In this current exhibition is one drawing where numbers prevail over two humans ( Adam and Eve) standing in the middle of that “universe” – diminished and doubtful. An appropriation of compositions and accentuation of the narrative detail, both are in combatant mood vis a vis early and heroic Modernism. Selected motives/ forms/compositions he may have seen in galleries, museums, churches, books and on internet, forge a depart from 20th C obsession with originality ( the myth analysed by Rosalind Krauss) and from “not breaking the flat plane” ( Clement Greenberg). Can I assume that he selects what moves him? 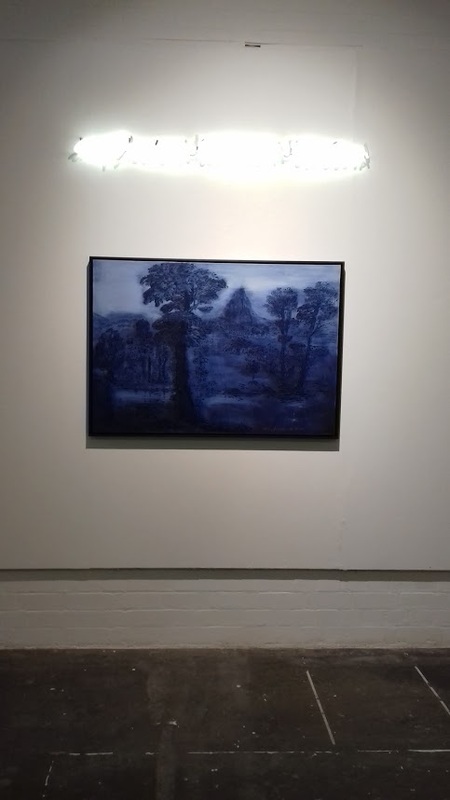 Clive Bell is often cited as defender of “art’s quality that provokes our aesthetic emotions…….when I speak of significant form, I mean a combination of lines and colours (counting white and black as colours) that moves me aesthetically” (The Aesthetic Hypothesis”). Godbold chose those lines and contours that were already proved to deliver that impact on him. Does that make him a copyist at times? To some degree? Not in the slightest. 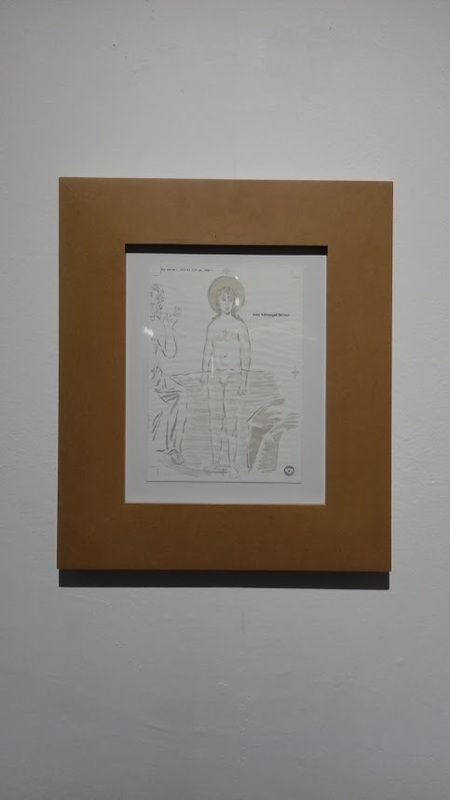 Godbold’s ink and laser print Semi-Submerged Saviour, 1998 (25.5 x 18.5cm) keeps the proportions and detail seen in Ravenna(or online) including the impersonation of river Jordan on the left. A copyist would include all – whereas Godbold’s leaves out the liturgical, most significant, St John the Baptist, and more than a half of the mythological bystander – river Jordan. The absences transform the meaning. Yet, he keeps as much of the original style as the chosen technique guarantees. Consequently – style is something he is analysing, disputing, debating, re-thinking – but still applying. Those two points hold a promise of an answer: Personality of the artist and the overall outlook of a group…. His personality reminds me Albert Camus musing about The Myth of Sisyphus – on the will to live with dignity and authenticity. Those two qualities are grounded, in his case, in seeing, in observing, in what he makes visible. Obviously he cannot belong to a group working in the 5th C in Ravenna . Instead – he can share an overall outlook of a group of artists living during his life time. Art Povera and Conceptual Art contribute material and idea. In 1969, Sol LeWitt publish “Sentences for Conceptual Art” in the little magazine O-9 (New York), edited by Vito Acconci and Bernadette Mayer. Will any of Judd’s conditions appear in the red drawing? and in the acrylic painting on canvas titled My past burried in a shallow grave (2010) ? 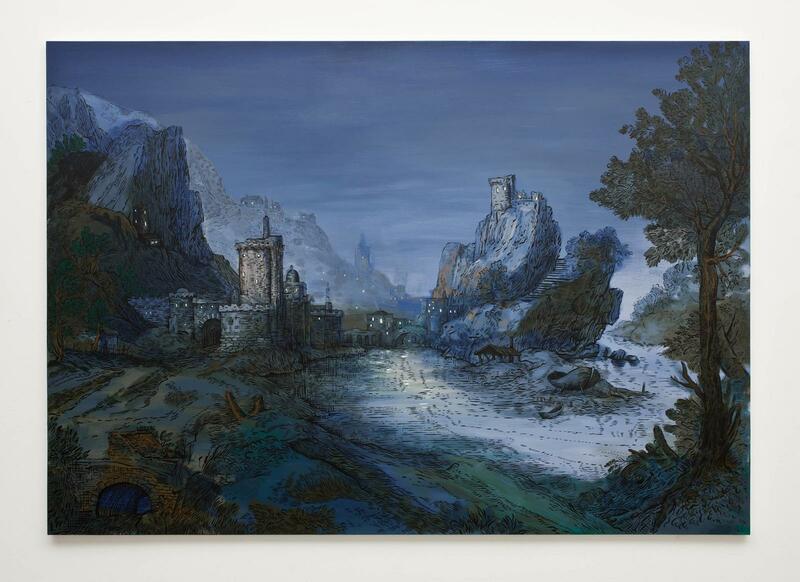 Godbold works in an “0bsolete form” – using current means, he goes beyond abstraction and inner model. Does he share anything with conceptual art? Does he share Donald Judd’s dim view of painting? The main thing wrong with painting is that it is a rectangular plane placed flat against the wall. A rectangle is a shape itself; it is obviously the whole shape; it determines and limits the arrangement of whatever is on or inside of it. In defiance, Godbold does this: numerous rectangles, framed and placed in a way recalling the Salon or commercial galleries in Paris… I sense that the Judd’s view of conceptual art both attracts and challenges Godbold – to provide something that protects freedom to be irrational. Not only that – it must satisfy something in his imaginations. 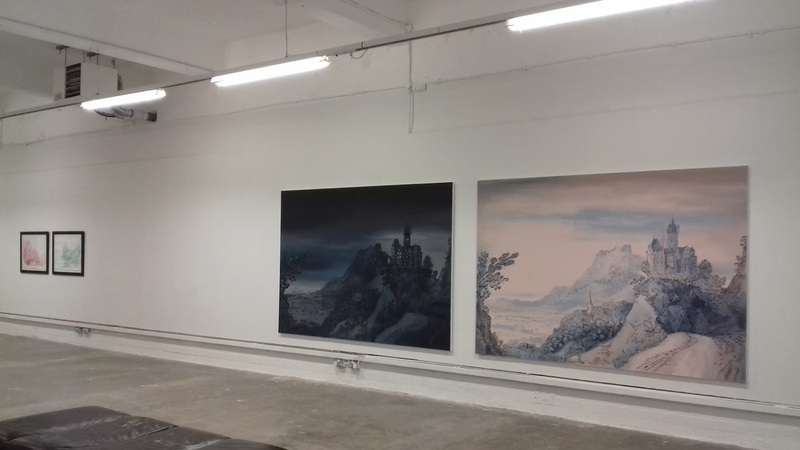 The seventeen metre wall was painted in red, in situ, by Colin Darke, following projection of Godbold’s drawings of a landscape. 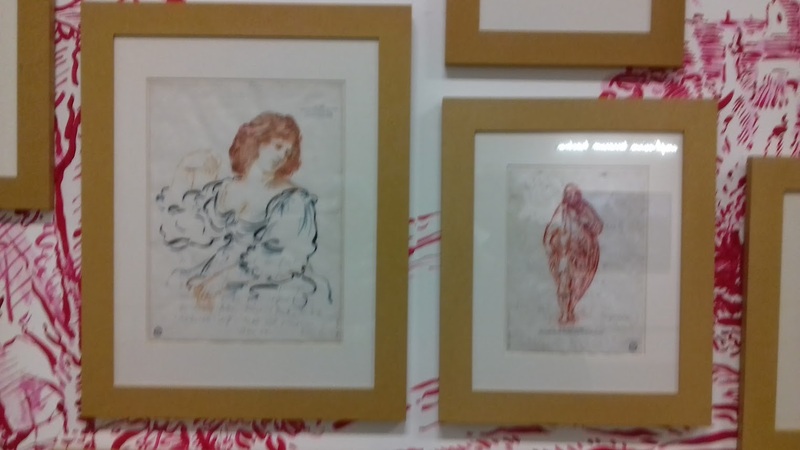 On it are 114 framed drawings or paintings whose stylistic pedigree includes medieval and renaissance citations. Some people will disagree. I visited an Academy in Leningrad in 1962, and in a private discussion, the students tearfully complained about being forced to copy museum pieces, day after a day, year after year… no freedom their western counterparts enjoyed. The same year Nikita Khrushchev published an article in Pravda newspaper, calling the sculpture by Ernst Neizvestny, exhibited in the Menagerie in Moscow, degenerate. It was a stump of ancient tree carved partly as a face and hand of a violinist … a fragment of a body as if growing out of the tree trunk. The sculptor also experienced – as a student in Riga- endless copying…..it did not diminish his creativity for ever. Neizvestny became a target because he moved away from prescribed socialist realism, which was rooted in obedience to the aesthetic canon dictated by the censor of Russian writers such as Anna Akhmatova and Mikhail Zoshchenko. Zhdanov formulated what became known as the Zhdanov Doctrine :”The only conflict that is possible in Soviet culture is the conflict between good and best“. (https://en.wikipedia.org/wiki/Andrei_Zhdanov). 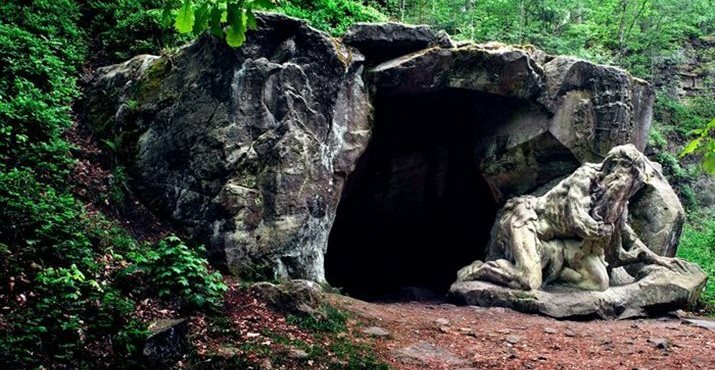 Irony is, that Zhdanov is not conversant with the folk tradition of carved sculptures in stone and wood in situ, a practice widely spread in forests where the Slavs live. 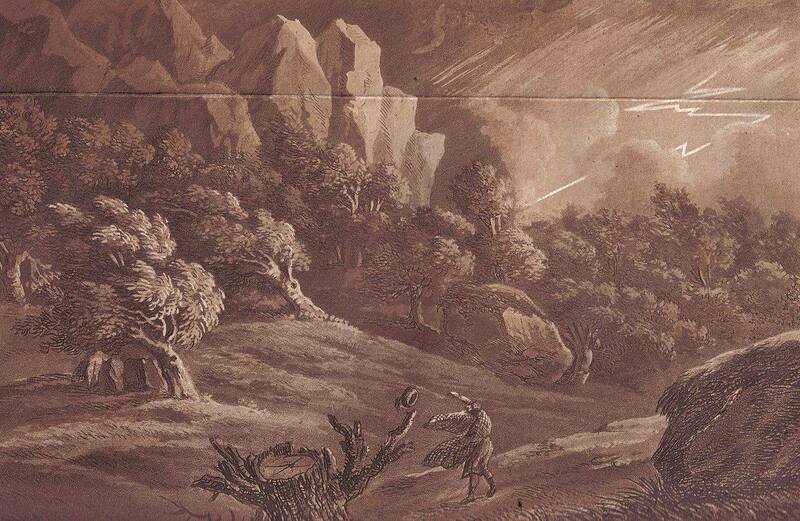 Perhaps best documented is the sculptor Matthias Braun (18thC) who carved biblical stories from rocks in situ at Kuks. Khruschev would label it “degenerate”. A measure is something Godbold both masters and ignores in turn, works on the thin line of difference between found art and new. This strategy has active enemies: the fear of “not being original” as defined by Modernism … and the representation as interpretation of intensified recovery. 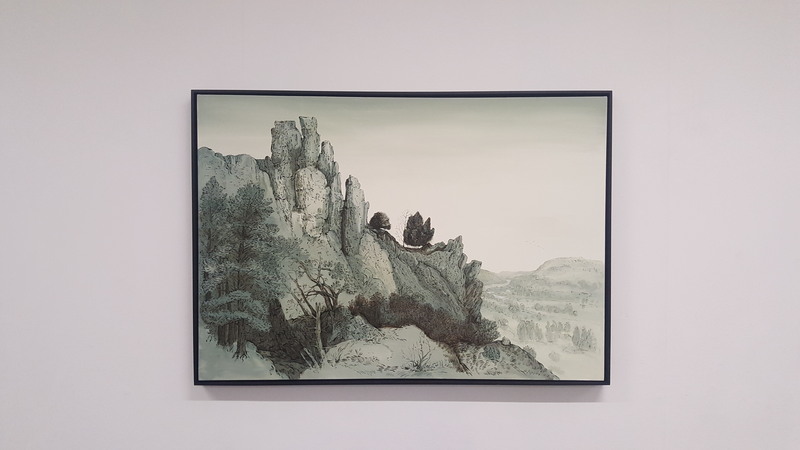 Like a good researcher – he does commit to one common value: hand made drawings and paintings, dependendent on a tight co-ordination of eye, hand and memory. His construct of meaning becomes more obvious when comparison is made with another “translation” of older art into modern idiom. Voynich Botanical Studies, by Miljohn Ruperto and Ulrich Heltoft, ongoing since 2013, are a good example. The gallery statements gives the background information, which my readers may not have, hence I copy and paste it here. 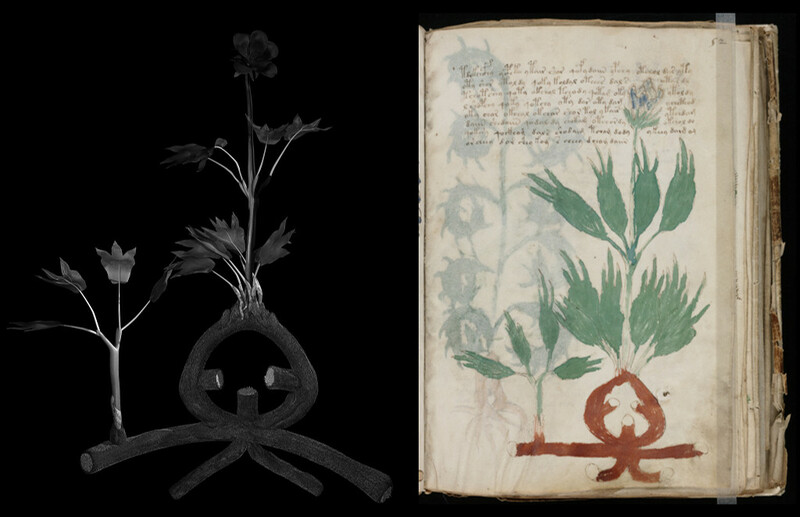 Accessed online on Voynich Botanical Studies, comparison of original and Ulrich Heltoft’s response. Is the title of the exhibition, carefully chosen by Godbold, directing attention to that thin line of difference? Nightfall – limits visibility, thus making the ” de terrarum tractum” unmeasurable, irrational, conceptual, imagined, uncertain, not observable,possibly not existing. Godbold places drawing and painting into that remove from the ample tracks of the Earth. Tracks which his “sources” (previous artists) might have observed. And then, mutating the size he takes ownership of what others observed, of their wisdom or follies – and translates it, into the same medium! 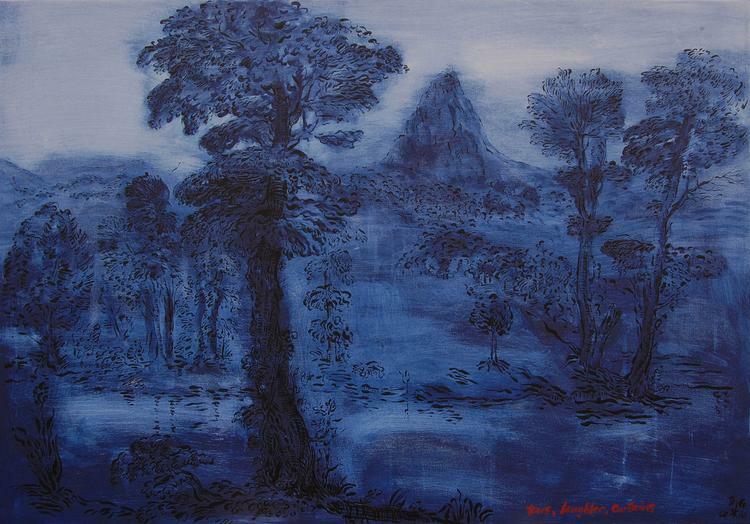 The blue hues dominate the nightfall – the tonality is reminiscent of Dutch 18th C , but the high horizon signifies Italian landscape from Baldovinetti onwards. 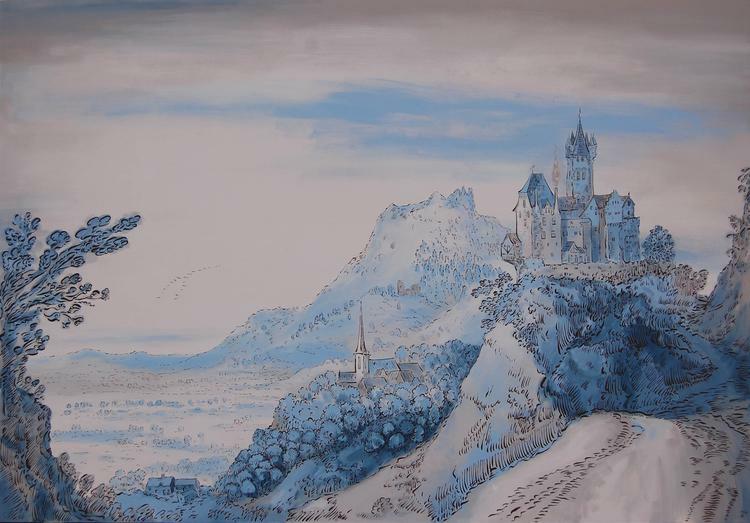 It shares motives, not light, that Claude Lorraine mixed in his: romantic ruins, large single trees. amplissium terrarum tractum …start with an ablative of the substantivum – I read it as designating a place anywhere. Amplissium pictoris opus non colossus sed historia appears written in 16th C about Raphael: Vast part of painter’s work is but a story. 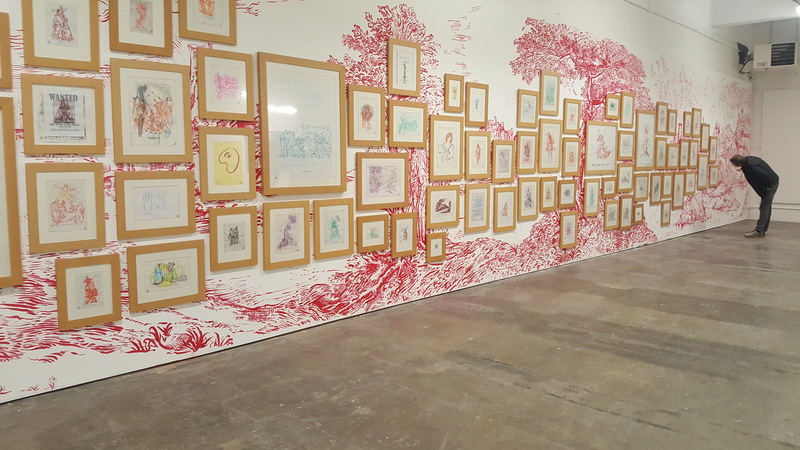 This connects well to my earlier awareness that and how Godbold tells stories – stories of his being with other art. If so, it matters what the story is of. Godbold suggests landscape – terrarum tractum – parts of landscape. A kind o subjective visual translation. And he is diligent doing that. Madly so. But allows figural drawing. 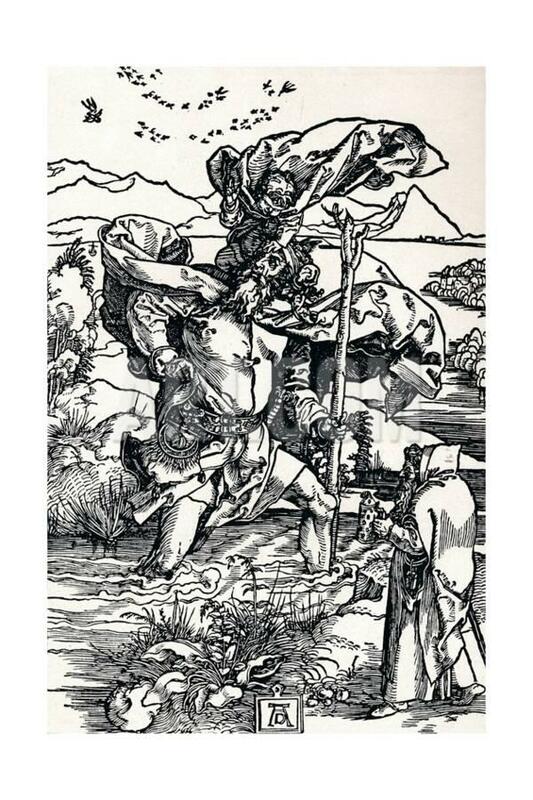 The folded and bended flying drapery of St Christopher is reminiscent of Albrecht Duerer around 1500. The exhibition embraces multitude of motifs, sources, places, time… in harmony with that claim. Like an incomplete visual dictionary – Amplissimum as the genitive of the superlative of “amplus” means widest, most spacious, largest , according to external circumference and capaciousness within. Hence it is never complete, finished, closed. The openness, of course is a necessary condition of art. The kernel of the word amplissium directs the mind from the heights of the universe down … to the second word in the title, the Earth: terra – and its genitive terrarum. Not to all of it just to a one tract at time – a quest rather than achievement. Moving from “land” in the first gallery, to time in the second space. 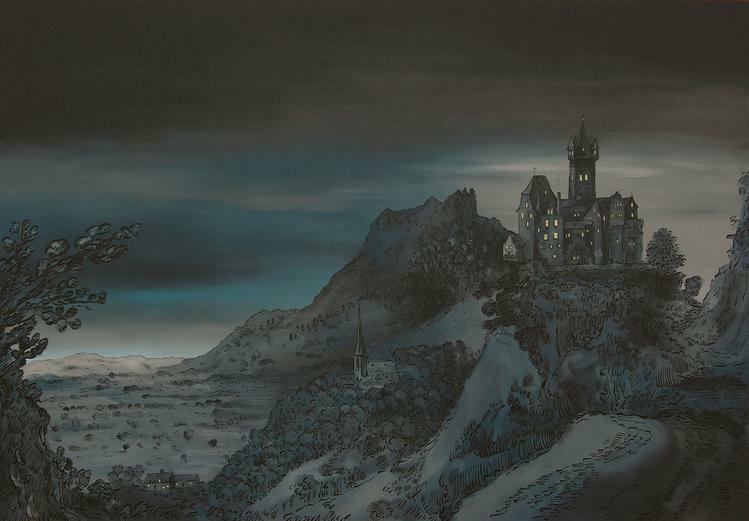 There the same composition gets painted once as a night and once in a daylight chromatics. “The basic formulation of Buber’s philosophy (the philosophy of dialogue) is contained in I and Thou (Ich und Du in German) where he makes a radical distinction between two basic attitudes of which men are capable, described as I-Thou and I-It. I-It is the relation between subject and object, involving some form of utilization or control, the object being wholly passive. 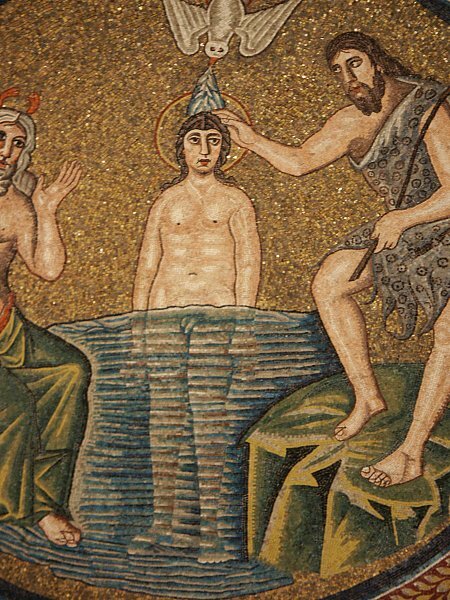 Godbold must have some reciprocity with the maker of Ravenna mosaics, to start with and then controlled which part to select. Creating art is a privileged mode of assuming and realising the paradox of being a mortal human being, conscious of the past and thinking of the future. It blurs the boundary between the theoretical and biographical, personal and general. The artist’s activity is also deeply significant in terms of its power of articulating a coherent world. Their achievements are worthy of admiration because they involve the creation of virtual worlds. To re-create a virtual world that can do justice to the complexity of the real world is an almost “miraculous” fact, as Merleau-Ponty says of Cézanne. It is also doomed to fail – because an artist can never say all that may be revealed. This leads Albert Camus to conclude that creative activity, like all free activities, is in the end only another attempt at dealing with the absurdity of human life ( The Stranger, 1942, 130). Art is the best instrument we have to cope with it. Godbold shares with a group of contemporaries fondness for citation, quotation, appropriation, his subject is the selection, combination, and matching of fragments from other art. Significance of his achievement is that it looks both old and new. Not Janus like, rather like a well understood irony. 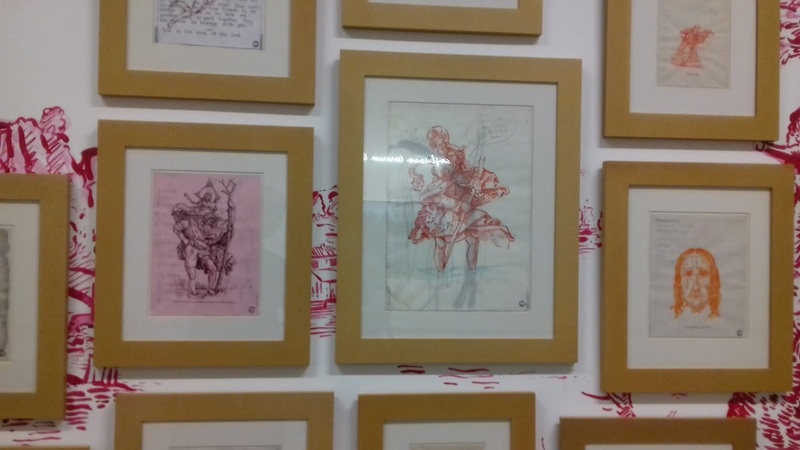 This entry was posted in essay and tagged A Camus, A Duerer, C Bell, C. Greenberg, D Judd, drawing, E Neizvestny, Kuks, M Braun, M Buber, M Shapiro, Malingue Gallery Shanghai, painting, Ravenna, Ulrich Heltoft, Voynich Botanical Studies, W Blake. Bookmark the permalink.